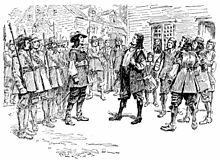 Bacon's Rebellion was an armed rebellion in 1676 by Virginia settlers led by Nathaniel Bacon against the rule of Governor William Berkeley. The colony's dismissive policy as it related to the political challenges of its western frontier, along with other challenges including leaving Bacon out of his inner circle, refusing to allow Bacon to be a part of his fur trade with Native Americans, and attacks by the Doeg people, helped to motivate a popular uprising against Berkeley, who had failed to address the demands of the colonists regarding their safety. 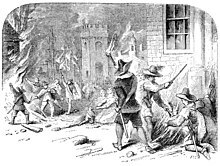 Thousands of Virginian from all classes (including those in indentured servitude) and races rose up in arms against Berkeley, attacking Native Americans, chasing Berkeley from Jamestown, Virginia, and ultimately torching the capital. The rebellion was first suppressed by a few armed merchant ships from London whose captains sided with Berkeley and the loyalists. Government forces from England arrived soon after and spent several years defeating pockets of resistance and reforming the colonial government to be once more under direct royal control. It was the first rebellion in the American colonies in which discontented frontiersmen took part (a somewhat similar uprising in Maryland involving John Coode and Josias Fendall took place shortly afterwards). The alliance between European indentured servants and Africans (many enslaved until death or freed), united by their bond-servitude, disturbed the ruling class, who responded by hardening the racial caste of slavery in an attempt to divide the two races from subsequent united uprisings with the passage of the Virginia Slave Codes of 1705. While the farmers did not succeed in their initial goal of driving the Native Americans from Virginia, the rebellion did result in Berkeley being recalled to England. The immediate cause of the rebellion was Governor Berkeley's refusal to retaliate for a series of Native American attacks on frontier settlements. In addition, many colonists wished to attack and claim Native American frontier land westward, but they were denied permission by Gov. Berkeley. Modern historians have suggested the rebellion may have been a power play by Bacon against Berkeley and his favoritism towards certain members of the court. Bacon's financial backers included men of wealth from outside Berkeley's circle of influence. Historian Peter Thompson argues that Bacon's motivation was a personal vendetta between Berkeley and him. However, Bacon's followers used the rebellion as an effort to gain government recognition of the shared interests among all social classes of the colony in protecting the "commonality" and advancing its welfare. When Sir William Berkeley refused to retaliate against the Native Americans, farmers gathered around at the report of a new raiding party. Nathaniel Bacon arrived with a quantity of brandy; after it was distributed, he was elected leader. Against Berkeley's orders, the group struck south until they came to the Occaneechi people. After convincing the Occaneechi to attack the Susquehannock, Bacon and his men followed by killing most of the men, women, and children at the village. Upon their return, they discovered that Berkeley had called for new elections to the Burgesses to better address the Native American raids. The recomposed House of Burgesses enacted a number of sweeping reforms (known as Bacon's Laws). (Bacon was not serving his duty in the House; rather, he was at his plantation miles away.) It limited the powers of the governor and restored suffrage rights to landless freemen. After passage of these laws, Nathaniel Bacon arrived with 500 followers in Jamestown to demand a commission to lead militia against the Native Americans. The governor, however, refused to yield to the pressure. When Bacon had his men take aim at Berkeley, he responded by "baring his breast" to Bacon and told Bacon to shoot him. Seeing that the governor would not be moved, Bacon then had his men take aim at the assembled burgesses, who quickly granted Bacon his commission. Bacon had earlier been promised a commission before he retired to his estate if he could only be on "good" behavior for two weeks. While Bacon was at Jamestown with his small army, eight colonists were killed on the frontier in Henrico County (from where he marched) due to a lack of manpower on the frontier. After months of conflict, Bacon's forces, numbering 300-500 men, moved to Jamestown. 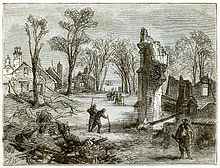 They burned the colonial capital to the ground on September 19, 1676. Outnumbered, Berkeley retreated across the river. Before an English naval squadron led by Thomas Larimore could arrive to aid Berkeley and his forces, Bacon died from dysentery on October 26, 1676. John Ingram took over leadership of the rebellion, but many followers drifted away. The rebellion did not last long after that. Berkeley launched a series of successful amphibious attacks across the Chesapeake Bay and defeated the rebels. His forces defeated the small pockets of insurgents spread across the Tidewater. Thomas Grantham, a captain of a ship cruising the York River, used cunning and force to disarm the rebels. He tricked his way into the garrison of the rebellion, and promised to pardon everyone involved once they got back onto the ship. However, once they were safely ensconced in the hold, he trained the ship's guns on them, and disarmed the rebellion. Through various other tactics, the other rebel garrisons were likewise overcome. Bacon's wealthy landowning followers returned their loyalty to the Virginia government after Bacon's death. Governor Berkeley returned to power. He seized the property of several rebels for the colony and executed 23 men by hanging, including the former governor of the Albemarle Sound colony, William Drummond, and the collector of customs, Giles Bland. After an investigative committee returned its report to King Charles II, Berkeley was relieved of the governorship, and recalled to England. "The fear of civil war among whites frightened Virginia's ruling elite, who took steps to consolidate power and improve their image: for example, restoration of property qualifications for voting, reducing taxes, and adoption of a more aggressive American Indian policy." Charles II was reported to have commented, "That old fool has put to death more people in that naked country than I did here for the murder of my father." No record of the king's comments have been found; the origin of the story appears to have been colonial myth that arose at least 30 years after the events, although the king prided himself on the clemency he had shown to his father's enemies. Indentured servants both black and white joined the frontier rebellion. Seeing them united in a cause alarmed the ruling class. Historians believe the rebellion hastened the hardening of racial lines associated with slavery, as a way for planters and the colony to control some of the poor. Historians question whether the rebellion by Bacon against Berkeley in 1676 had any lasting contemporary significance for the more-successful revolution a century later. The most idolizing portrait of Bacon is found in Torchbearer of the Revolution by Thomas Jefferson Wertenbaker, "one of the worst books on Virginia that a reputable scholarly historian ever published." The central area of debate in this era was Bacon's controversial character and complex disposition. Nothing better illustrates this than Wilcomb Washburn's The Governor and the Rebel. Rather than singing Bacon's praises and chastizing Berkeley's tyranny, Washburn found the roots of the rebellion in the colonists' intolerable demand to "authorize the slaughter and dispossession of the innocent as well as the guilty." More nuanced approaches on Berkeley's supposed tyranny or mismanagement entertained specialist historians throughout the middle of the century, leading to a diversification of factors responsible for Virginia's contemporary instability. Wesley Frank Craven in the 1968 publication The Colonies in Transition argues that his greatest failings took place during the revolt, near the end of his life. Bernard Bailyn pushed the novel thesis that it was a question of access to resources, a failure to fully transplant Old World society to New. James Rice's 2012 narrative Tales from a Revolution: Bacon's Rebellion and the Transformation of Early America, whose emphasis on Bacon's flaws echoes The Governor and the Rebel, integrates the rebellion into a larger story emphasizing the actions of multiple Native Americans, as well as placing it in the context of English politics; in this telling, the climax of Bacon's Rebellion comes with the Glorious Revolution of 1688/89. Despite recent historians' views of the conflict, many in the early United States, including Thomas Jefferson, saw Bacon as a patriot and believed that Bacon's Rebellion was a prelude to the later American Revolution against English colonial rule. This understanding of the conflict was reflected in 20th-century commemorations, including a memorial window in Colonial Williamsburg, and a prominent tablet in the Virginia House of Delegates chamber of the Virginia State Capitol in Richmond, which recalls Bacon as "A great Patriot Leader of the Virginia People who died while defending their rights October 26, 1676." Robert Beverley reported, in his 1705 book on the history of Virginia, that some British soldiers who had been dispatched to Jamestown to quell Bacon's Rebellion gathered and ate leaves of Datura stramonium, and spent 11 days acting in bizarre and foolish ways before recovering. This led to the plant being known as Jamestown weed, and later jimsonweed. ^ "Bacon's Rebellion". nps.gov. National Park Service. Retrieved 6 October 2015. ^ Webb, Stephen Saunders (1995). 1676: The End of American Independence. Syracuse University Press. pp. 87–93. ISBN 978-0-8156-0361-0. Retrieved 1 February 2013. ^ Webb, Stephen Saunders (1995). 1676: The End of American Independence. Syracuse University Press. pp. 10–13. ISBN 978-0-8156-0361-0. Retrieved 1 February 2013. ^ a b c d Eric Foner, Give Me Liberty! : An American History (New York: W.W. Norton & Company, 2009), p. 100. ^ "Green Spring Plantation". Historic Jamestowne, National Park Service. Retrieved 25 March 2008. ^ John Berry, Francis Moryson, and Herbert Jefferys, "A True Narrative of the Rise, Progress and Cessation of the Late Rebellion in Virginia, Most Humbly an Impartially Recorded by His Majesties Commissioners, Appointed to inquire into the Affairs of the Said Colony", Ed. by Charles Andrews, in Narrative of the Insurrections 1675 to 1690, New York: Charles Scribner's Sons, 1915, pp. 111–113. ^ Susan P. Castillo; Ivy Schweitzer (2001). The literatures of colonial America. Blackwell Publishing. p. 225. ISBN 978-0-631-21125-9. ^ John Berry, Francis Moryson, and Herbert Jefferys, "A True Narrative of the Rise, Progress and Cessation of the Late Rebellion in Virginia, Most Humbly an Impartially Recorded by His Majesties Commissioners, Appointed to inquire into the Affairs of the Said Colony." Ed. by Charles Andrews, in Narrative of the Insurrections 1675 to 1690, (Charles Scribner's Sons: New York, 1915), 116. ^ "Bacon's Declaration in the Name of the People 30 July 1676". University of Groningen. Retrieved November 12, 2016. ^ Edward Channing; Eva G. Moore (1908). A history of the United States. Macmillan. p. 88. ^ Webb, Stephen Saunders (1995). 1676: The End of American Independence. Syracuse NY: Syracuse University Press. ISBN 9780815603610. Retrieved 1 August 2017. ^ Bragdon Kathleen J., The Columbia Guide to American Indians of the Northeast, Columbia University Press, 2005, p. 112. ^ Narratives of the Insurrections, 1675–1690, ed. Charles McLean Andrews, New York: Charles Scribner's Sons, 1915, p. 139. ^ Zinn, Howard (1997). A People's History Of The United States. New York, NY: The New York Press. p. 281. ISBN 1-56584-724-5. ^ "Green Spring Plantation". Historic Jamestowne. Retrieved 25 March 2008. ^ Waldrup, Carole Chandler, Colonial Women: 23 Europeans Who Helped Build a Nation, McFarland, 1999, p. 86. ^ Cooper, William J., Liberty and Slavery: Southern Politics to 1860, Univ of South Carolina Press, 2001, p. 9. ^ Rice, James D. Tales from a Revolution: Bacon's Rebellion and the Transformation of Early America. Oxford University Press (Oxford: 2012.) Print. Pg. 204. ^ Craven, Wesley Frank. The Colonies in Transition: 1669-1713. Harper & Row, Publishers (New York: 1968.) Print. ^ Bailyn, Bernard, "Politics and Social Structure in Virginia." Seventeenth-Century America, pp. 90-108. ^ Morgan, Edmund S. American Slavery, American Freedom: The Ordeal of Colonial Virginia. W.W. Norton & Company, Inc. (New York: 1975.) 270. ^ Rice, James D. Tales from a Revolution: Bacon's Rebellion and the Transformation of Early America. Oxford University Press (Oxford: 2012.) Print. ^ a b Gardner, Andrew G. (Spring 2015). "Nathaniel Bacon, Saint or Sinner?". Colonial Williamsburg Foundation. Retrieved 2018-05-30. ^ a b "Bacon's Rebellion in Virginia in the years 1675 & 1676 | Virginia Museum of History & Culture". www.virginiahistory.org. Retrieved 2018-05-30. ^ "About the Capitol - High School". Virginia General Assembly - Capitol Classroom. Retrieved 2018-05-30. ^ Karen Ordahl Kupperman (2012). The Atlantic in World History. Oxford UP. pp. 89–90. ISBN 9780195338096. Allen, Theodore W. The Invention of the White Race, Vol. 2: The Origins of Racial Oppression in Anglo-America. London: Verso (1997). Cullen, Joseph P. "Bacon's Rebellion," American History Illustrated, Dec 1968, Vol. 3 Issue 8, p. 4 ff. Rice, James D. "Bacon's Rebellion in Indian Country," Journal of American History, vol. 101, no. 3 (Dec. 2014), pp. 726–750. Tarter, Brent. "Bacon's Rebellion, the Grievances of the People, and the Political Culture of Seventeenth-Century Virginia," Virginia Magazine of History & Biography (2011) 119#1 pp 1–41. Webb, Stephen Saunders (1995). 1676, the end of American independence. Syracuse University Press. ISBN 978-0-8156-0361-0.